Highways. 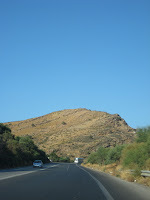 There is a main road connecting West to East, the Eastern part, after Malia, being under construction. They call it “highway”, probably because it was partially financed by EU (75% of the total founding), and they had to report a proper use of money. Otherwise, there are very many speed limitations, mostly of 50-60 km/h, but also some of 20 km/h!! Most of the time there is one and a half lane for each direction (like they where able to finish only three quarters of the road). The asphalt is decent, but there are even more road humps as compared to the Romanian highways! (the same is valid for the inner city roads). 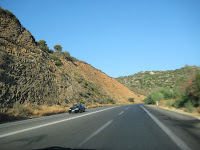 There are plenty of nice views of the coast and of the mountains, the road goes up and down on the hill, sometimes they dug the stone to make the road, and the traffic is not very heavy. This makes driving a quite nice experience. Traffic. Low, except for religious holidays such as Saint Mary. 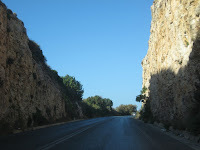 However, one may need patience on certain Iraklio roads. Oil stations. Shell, BP, EOK are present everywhere. There is an employee who comes to fill your tank, and you have to pay him the money, in cash. It seems that they also expect to pay some tip for this. One may also pay by card at the cashier, but this is not always working. Cars. I have noticed mainly old or small cars – like Hyunday Atos, Daewoo Matiz, Renault Clyo, with small engines. 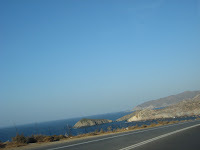 Particularly in the East (around Malia and Elounda), expensive cars are also present on the roads. Hai la Baba Rada … Socioloaga!! !